Johnny Stucco was born in a night watchman's trailer on the Hemisphere construction site in San Antonio. His mother died in childbirth - her last words being: "Got any coffee?" Johnny was given a short length of re-bar for a teething ring and a miniature hard-hat and a union card for his 3rd birthday. Johnny's father worked for a building contractor who specialized in school construction. He didn't attend schools - he helped build them. It's said that he learned to read from blueprints and even today our memos to him have to be written on dark blue paper with white ink. His father read him to sleep with chapters from the only two books in their camper - a Depression-era government pamphlet called Stucco: The Modern Miracle and A Boy's First Book of Ratios and Formulas for Decorative and Cast Plaster Details. Johnny Stucco and Uncle "Vito Terazzo"
Johnny's size made him a valuable asset on construction sites. He was the right size to tuck asbestos insulation into all the hard-to-reach places. After years of inhaling asbestos fibers, cement and construction site dust - Johnny was told to seek work in a dust free, sterile atmosphere. He applied for the vacant position of architectural editor here at TE and when asked for his resume he said; "What's a resume?" Having passed our test, he was immediately hired. Johnny now explains architectural terms to us and writes The Dead Architects Society and other articles relating to the buildings of Texas. He doesn't eat the bountiful homemade meals that the rest of the staff enjoys. Johnny prefers the food he grew up on - the wholesome fare of catering trucks. Of course Stucco is merely a nickname. Johnny's father and uncles used to be in the flooring business under the real family name - The Terazzo Brothers. 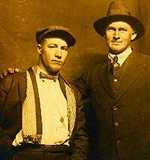 Johnny and Jay Walker share an office in the basement of One Texas Escapes Plaza. They can be reached through the editor's email at editor@texasescapes.com.